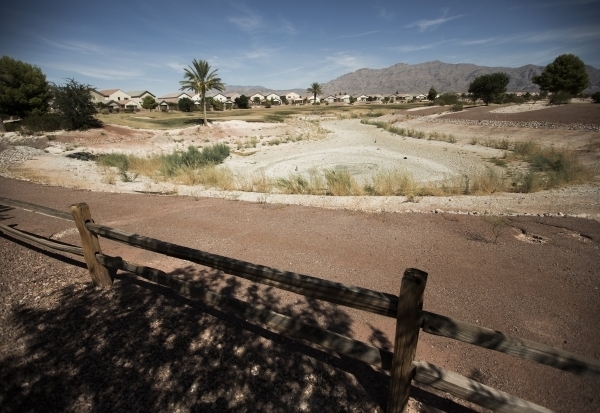 This golf course is made up of 200 acres surrounded by 1500 homes near Floyd Lamb Park at Tule Springs. The 27 hole course opened in 2001. It is “protected” by a long-standing development agreement outlining …how the course is used, how often it has to be…watered, etc. The CC&R’s of the development also require that three quarters of the property owners must agree to any redevelopment of the property. The course was purchased by Desert Lifestyles LLC in 2015. Golf Advisor announced that Silverstone Golf Club has closed permanently as of 9-1-2015. Employees and members were given no advance notice of the closure. Desert Lifestyles LLC is represented by Ronald Richards of Southern California. Western Golf Properties was hired to manage the property. When the course was closed, a fence was erected around the clubhouse. A U.S. District Judge issued a preliminary injunction against the owner and ordered them to restore the course to its pre-sale condition. The judge set a date of Dec. 15, 2015 for a hearing on how that restoration would take place . Two days before the hearing, the course was sold to Stoneridge Parkway LLC, which company then filed for bankruptcy. The bankruptcy placed an automatic stay on actions related to the property. The City of Las Vegas City Council held a hearing in June 2016 to consider assessing civil penalties of $4500 per day or $750 per parcel against Stoneridge Parkway LLC (in bankruptcy). The council voted unanimously to assess $2800 in failed inspection fees, daily civil penalties of $94,500 for all 6 parcels, and filed a lien for $97,380. As of May, 2017, fines and fees total $1.6 million. In March, 2017, the bankruptcy judge dismissed the Stoneridge Parkway bankruptcy case. The Homeowners Association still plans to sue for restoration of the golf course.